We enjoyed a great turn out on Thursday 23rd at Hornets RFC. An evening that was well attended and encouraging for the season ahead. Ahead of the meeting Clare Daniels and Tony Spreadbury ran a Fitness Session for personal benchmarking purposes. Under Tony’s watchful gaze half the group completed the Bronco Run. This allows participants to complete a 1.2km run in their own best time by running out 20mtrs and back, 40mtrs and back and 60mtrs and back five times. The best time on the evening was an impressive 5 mins 18 secs from new member Simon Reeves. Clare then oversaw the Yo-Yo test, a more familiar and now infamous test of max VO2! Tom Evans-Jones delivered an impressive display of fitness, achieving 18.2. 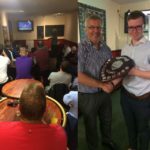 The evening began with formal presentation to Daniel Evans of his award from last season for “Most Improved Referee”, and well deserved. Clare set out plans for training and development for the forthcoming season. Further details of the training schedule will be published on the website. Laurence gave an update on recruitment activity and confirmed that we are maintaining healthy numbers for the society with approximately 65 active referees. Laurence advised everyone that the new website was launched in June. He reminded everyone that it is very much a work in progress and that there was a lot of content that needed to be added. Laurence will be updating a page each month and will send out information requests via who’s the ref inviting members to contribute to the process. Bruce welcomed new members to the meeting. Bruce ran through the academy training structure and invited new members to be part of that group to support their early development. Chris Hoadley talked through plans the development group, he will be sharing with those individuals in the development group their individual plans. Chris reminded everyone that the development sessions are open to all members to attend if they wish, however all attendees will be required to complete the fitness sessions if attending the meeting! Reg gave feedback to the meeting on September appointments. Fixtures look to be very good, the concerns over the restructuring of the leagues seem to have settled down. We have a number of referees that still need to do availability and a number of fixtures not yet covered for 29th September. Clare gave some feedback on work that has been done over the summer on the Young Match Official program. The details of the program are on the website. A request was made for anyone who would be interested in supporting this program in the YMO co-ordinator role. Important that referees refresh their knowledge of the Laws relative to the age group pre game. Referees need to consider how they approach a Youth fixture and the way that they manage communication with young players and coaches. Where did the contact begin where did it end? Was there Force in the contact? Referees need to make their decisions accurately and in game context. “Was the Foul Play Clear and Obvious? Is the outcome what the players expected? Remember in Youth Rugby, there is no advantage to be played from Foul Play. The evening ended with some hospitality from our hosts Hornets RFC. Good luck to all for their upcoming September fixtures.